Occupation: Art Director, Graphic Designer, Creative Director and Principal of the branding firm Li, Inc. Known for: Integrating the inscrutable design aesthetic of your favorite amazian fashion designers (from Alexander Wang to Philip Lim to Jason Wu) into the strangely-important little pieces–like label tags and gift boxes. The NYTimes did a fascinating profile of Li over the weekend, in which he is depicted as both a design and communication genius. In the article, Rodarte co-designer Kate Mulleavy explains Li’s gift: “I would describe Patrick’s work as like distilling something to the purest form”–likely why the boldest and most complex of the fashion world flock to him when trying to determine their season’s essence. We fancy ourselves a bit complex… now, all we have to do is see if he’ll redesign the DISGRASIAN logo in exchange for both of our first-born. And maybe a nice bottle of scotch. 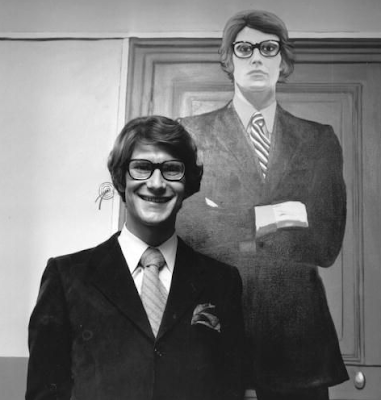 The world bid adieu to fashion icon, feminist, pioneer, and artist Yves Saint Laurent, aged 71, this weekend. In light of the news, our day has surely lost a bit of its color–but Saint Laurent never feared change, and this is perhaps merely change, so we will follow suit.